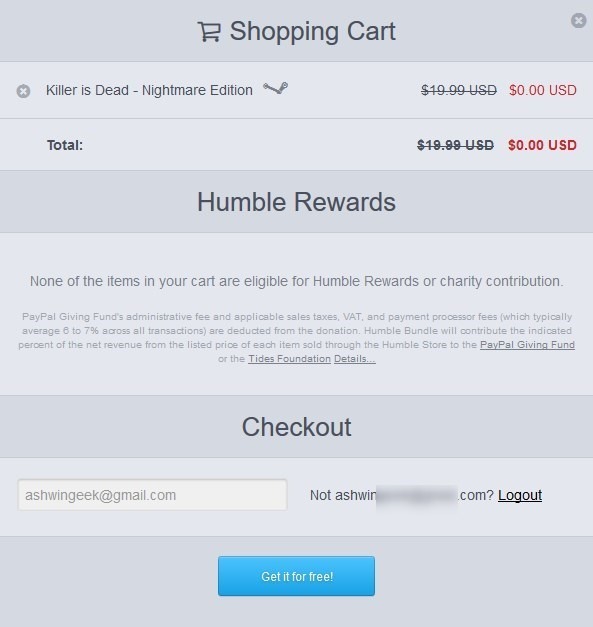 Killer Is Dead - Nightmare Edition, is Free on Humble Bundle for a limited time. The game is a third-person hack and slash game from SUDA51, and it shows in the graphics, they are unique. If you like hack and slash games with a bit of skill, (not button mashing), but more like Shadow of Mordor or Devil May Cry, you may like this game. It is more or less similar to DMC, except that the story in Killer is very weird, at best. The game isn’t exactly long, you could finish it within a day. Well, for free you can't complain. 1. Go to the Humble Bundle Store listing for Killer Is Dead - Nightmare Edition. 2. Click on add to cart, and then checkout for free. 3. You need to activate the key on Steam, by 10AM Pacific on Saturday, December 2nd, 2017! You will need to fix some issues with the game's frame rate, and a bug which affects CPUs with dual-cores. Fortunately, steps for these are available on PCGamingwiki (High Frame Rate and Issues Fixed sections). Killer Is Dead - Nightmare Edition has trading cards, which you can sell on Steam for wallet credits.